Looks like a rollback is in play, the gap with the white space (highlighted pink) represents URLs that were ranking those days yet are not ranking now, if you noticed the old URLs ranking before the update are now almost back 90-100% of their old positions, some slight variations. Not for me. Still climbing every day and now I'm up 60% since 13.03. Seem to be a rollback of some sort. My sites got hit my medic update. The march update finally gave me back a lot of the rankings, but a few days later they all dropped again. There is still a ton of data to be dug into. Currently I'm researching the volatility angle to see where the rollback occurs cause it's definitely not a complete roll back. Lot of my sites that were propped up with semi relevant moderately strong 301s and hyper relevant low authority links got hit pretty good. Bouncing around but not recovered. Discussing with some big brands + two client audits I'm doing that are both heavily relying on 301s leads me to believe that's one of the areas of focus for this update. Anybody seeing similar? This is my current main concern on a project. I can't say that I noticed these updates directly related to 301's, but I had 4, with 2 big ones that, like yours, were semi-related (one actually unrelated). If you want some background on that, I wrote about it here. I've been getting -10% on every update for the past 2 years and making it up, then losing it again. My site is pretty cutting edge regarding everything. I've recently fixed an indexation problem though, haven't seen any recovery from that. I also have a big crawl budget improvement I'll be rolling out within a month I hope. Other than that, all I can see is that it's a 301 problem. I've already removed all 4 and intend to report back if I see any movement from it. They're moving pretty slowly on it. Those domains are still indexed at my main domain. I've tried pinging one to see if that helps. It's gonna take them recrawling most of the old links, I think, before it swaps over. One of them I'm going to toss up a new site on, which should quicken that one detaching. Beyond that, I'm at a complete loss and will start dripping content regularly and focusing on something else unless it recovers eventually. Social bookmarks are the fastest "safe" indexing method in the west these days, I usually drop 10 at all new 301s and they index next day (maybe same day but I don't check?) typically. I'm guessing a reversed 301 would respond similar. I've got a couple I'm going to remove this week if I don't see some rollback, will test the bookmarks for quick re-indexing and report back. Was out of state for the week, came back and could clearly see the update in my analytics (unfortunately another 5-10% loss for my site with some problems I'm fixing up. I don't have much more to offer since I'm still playing catch up, but here's some general confirmation all gathered in one spot. Almost a month has passed. Things should have stabilized by now. How's everyone doing/recovering? I'm up 116% in clicks, and up 136% in impressions since 12.03. 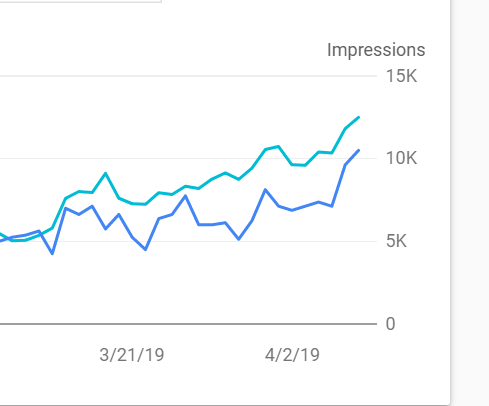 From what I can gather from the Search Console, the main gains come from pages that were not ranking well before but suddenly started performing better after the update. Before the update, around 60% of my content was ranking on the second or third page. Now, it looks like 2/3 of those pages have jumped to the first page, and started ranking for a lot of long tails. For me, it looks like this was a domain-level update. Suddenly Google decided that most of my posts are pretty good. Even ones that were published last month are starting to gain some traction, when before it would take at least three months to even appear on the second page. It's like suddenly I was removed from the sandbox (It actually may be true, because my site is nine months old,) or suddenly gained a bunch of high-quality links. Ok, so I'm not the only one seeing these results. I keep hearing it has settled but my one site is exploding. Does a set of all sets contain itself? Nice to see some positive trends! Our sites have remained pretty much perfectly flat in Q1 2019 after a year of consistent growth, so not much to report here. Hoping we get a boost soon! This is my current personal project. On the 11th 12k impressions by the 16th down below 4k impressions. Slight recovery but mostly just in total fringe rankings that don't drive clicks. Looks like some people here gained where I lost. This site has extremely thin content and lack of compliance with normal web standards so previous visibility was entirely traffic analysis and backlink driven. My site is stupid low quality from an on page signaling perspective. I think I was getting a pass because we have massive type in from chrome user agents and tend to have high click through when we get presented in specialized serps due to the aggressive branding. Unrelated but possibly a confounding factor. They started really censoring us in auto complete and google trends over the last year. Since then, rankings and brand searches are trailing off. (this is pre search console largely) I think I might have to 301 but I might end up just penalty spreading. I also really like the brand name. Looks like a lot of my march losses on this site align with gains from other members. My guess is they all have more content than me and less links from link round up circle jerk sites. Here's my blow harding on the update. I think they did a full node reranking to build a new labels database. Some trusted exception, classification tricks have been closed off and some link nodes re-weighted. I think they've devalued links from sites that link out a lot again as a whole. Some nodes that were rather valuable are no longer as valuable. Devaluing link round up pyramids that utilized older links appears have happened as the common theme for the devalued nodes. Read the rules for signatures.